Finished Size: Approx. 6” (15 cm) wide and 4” (10 cm) long. Yarn: Approx. 10 yards (9.5 m) of worsted weight yarn. Needles: Size 10 (6mm) needles, or one size up from size on label. Other Materials: Sewing needle, steamer, blocking surface, pins. Row 3: K9, K5tog, [SB2, K3tog] x 8,K1. Work a 6 row i-cord with the 3 remaining sts. I-cord - Knit to end of row, slide all stitches to the other end of the circular needle to work the next row. K3tog - Knit 3 stitches together. 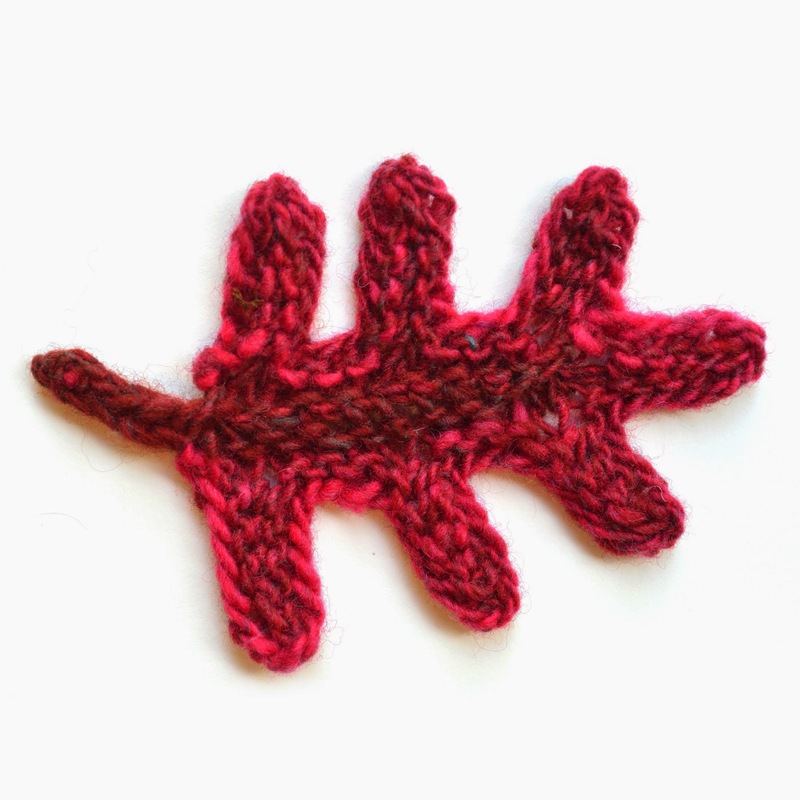 K5tog - Knit 5 stitches together. If K5tog is difficult: Slip 2 stitches knitwise together, K3tog, pass slipped stitches over. SB - Slip back to left needle. If you prefer to download a PDF version of this pattern, you can get it on ravelry. For a video showing how to do the decreases in this pattern, follow this link. This article will help if you want to use stacked decreases in other projects. I have a simple question. How many stitches do I start off with? Cast on 101 stitches, I recommend using the long tail cast on (the one with 2 strings). Do you join the stitches and knit in the round? Oh, I see why you would think that. The circular needle is because of the I cord. not the rest of the leaf. Thanks, I'll give it a try. Fun pattern!! I keep getting leftover stitches. For example, in the first row, I got 5 leftover stitches. I don't know where I went wrong. Hi, I could probably help in person, but it is a lot harder online. 1:find someone who'd done this in real life or Anixter who has make fox paws, they can help. 2. Post on your blog, Revelry page, or image sharing service So someone can help, or privately email me images. Post s video showing what you are doing to follow the pattern. SOMEONE will help.